part in advancing the general welfare and prosperity of his community. He has a substantial and comfortable home, and his land is in a high state of cultivation and productiveness. Mr. Stephens was born in Indiana in 1856, and is a son of Spencer and Nancy Stephens, both natives of Indiana. The parents had five children, who were all natives of the same state. Spencer Stephens died on his farm in Indiana in 1871, and Nancy Stephens died at Sheffield, Illinois, in 1880. In 1875 James Stephens removed to Sheffield, Illinois, and he moved six years later to Carroll county, northwestern Iowa, where he rented land until coming to Nebraska. In 1885, he purchased his present farm of one hundred and sixty acres in Wayne county, which was then partly improved, and since then he has been employed in adding to its value and productiveness. He has a five-acre grove, including shade and fruit trees. Mr. Stephens now owns two hundred and forty acres, but formerly had more. He has built all the buildings on his place, and improved it in many ways. In 1878, Mr. Stephens was united in marriage with Miss Maria Fisher, daughter of John and Margaret Fisher, natives of Pennsylvania. Mr. and Mrs. Stephens are the parents of ten children, namely: Orie, Edgar, Laura, Oscar, Archie, James, Stella, Viola, Irvin, and Spencer, all living. Mr. Stephens is well known throughout the county and has a reputation for uprightness and fair dealing in matters of business. He and his wife are prominent in social circles and have a wide circle of friends. They are interested in educational matters and other public movements, and represent the highest interests of the locality in which they live. George E. Willard, son of Paul and Nancy (Follett) Willard, was born in Winchester, New Hampshire, February 11, 1839. He was the fourth son of nine children, and has one sister residing in the state of Connecticut, one sister in the state of Massachusetts, and one in the state of New Hampshire; he also has two brothers, one resides in Genoa, Nebraska, and the other in Oklahoma. The father died April 25, 1852, and the mother in April, 1882. In the spring of 1857, our subject went to Grand Rapids, Michigan, where he remained about six months, and from thence going to Two Rivers, Wisconsin where he worked in a woodenware factory. In 1862, he went to Grand Haven, Michigan, where he engaged in the manufacture of woodenware, and was burned out in the spring of 1869; and in October of the same year Mr. Willard came west to Nebraska where he located at Genoa, where his brother, D. A. Willard, had located a year or two previously and was engaged in trading with Indians. Our subject took up a pre-emption claim of eighty acres, three miles east of Genoa, Nance county, Nebraska, and also purchased five hundred and seventy-five acres adjoining the town of Genoa, where he engaged in the stock business. In 1872 he came to Columbus, retaining his farm interests and continuing in the stock business. On February 21, 1882, Mr. Willard was married in St. Edwards, Nebraska, to Miss Catherine Coyle, who was born October 11, 1852, in Utica, New York state and who came to Nebraska with her parents Patrick and Margaret (Ely) Coyle, in 1872. Mrs. Willard's father died in June, 1904, and her mother in April, 1892. She has one brother, John T. Coyle, residing in St. Edwards, Nebraska, and one sister, Mrs. David Spencer, who resides in St. Edwards, Nebraska. Miss Coyle, now Mrs. Willard was the first school teacher of St. Edwards, Nebraska, where she taught for several years. After their marriage, Mr. and Mrs. Willard resided in Columbus, and in the spring of 1896 moved to St. Edwards, Nebraska, where they purchased land and engaged in farming, having four hundred acres under cultivation and some stock land. In 1905, Mr. Willard retired and moved to Columbus, Nebraska, where he bought a fine home, where they now reside. Mr. and Mrs. Willard have had three children, whose names are as follows: George P., who lives in Pierre, South Dakota; William C., and Margaret L., both of whom are under the parental roof. Mr. Willard has been prosperous and successful, owing one thousand and eighty acres of land in Nebraska and Kansas. He has lived the pioneer life in Michigan, where he homesteaded; in Wisconsin, and also in Nebraska, where he is widely and favorably known. Mr. Willard has been a member of the city council of Columbus since 1907, and enjoys the friendship and popularity of a host of people. In compiling a list of the representative farmers of Antelope county, Nebraska, a prominent place is accorded the name of Hugh McKay. For many years he has been engaged in agricultural pursuits in section twenty-six, township twenty-four, range seven, and has done a large part in developing the resources of that part of the country, and enjoys the respect and esteem of all who know him. He has a comfortable home and valuable estate, and is classed among the prosperous citizens of Antelope county. that city, he immediately started for the west, settling in LaSalle county. Illinois, where he lived ten years. In the fall of 1878 Mr. McKay came to Antelope county, Nebraska, by way of Des Moines, Iowa, driving the entire distance from Illinois, and after arriving here he took up a homestead, making the usual crude improvements possible in those days. such as building a sod house, etc., and experienced the many inconveniences and hardships incident to those times. Lumber was a very scarce commodity in those days, the railroad termination was then Fremont, Columbus being the nearest market place, seventy-five miles distant. Deer and antelope were plentiful in those days. Mr. McKay coming in the very earliest days of Nebraska's settlement, built and lived in two different sod houses before lumber could be had. In 1855 Mr. McKay was married to Miss Jane Patton of Ireland, this marriage taking place in Ireland. Four children were born to this union, whose names are as follows: Hugh, who is married to Miss Margaret Paul; William, married to Miss McIntyre; James, who is married to Miss Ada Meyers; and Alexandra, married to Miss Mattie McIntyre. In 1866 Mrs. McKay died deeply mourned by her husband and family and kind neighbors and friends. Mr. McKay remained eighteen months in Ireland after his wife's death, when leaving his four small children with his father, Hugh McKay, who came to America one year later than our subject, he sailed for the United States. On December 23. 1875, Mr. McKay again was married, the bride being Miss Jane Paul, and Mr. and Mrs. McKay are the parents of two children: Jennie, wife of Mr. Charles Green; and Lizzie, wife of Claude Green. Mr. and Mrs. McKay and family have a wide circle of good true friends and neighbors. Judge Douglas Cones is one of the best known residents of Pierce county, and has been a leading attorney in that vicinity for many years. He is prominent in business and political circles, has served two terms as county attorney, having been appointed district judge in 1899 to fill the vacancy created by the resignation of William V. Allen, on his appointment to the United States senate to fill a vacancy arising by the death of United States Senator Hayward. Douglas Cones was born on April 26, 1865, in Scott county, Iowa, and is a son of W. W. Cones who is a pioneer of northeastern Nebraska. The family settled in West Point in 1875; two years later moved to Wisner, and there our subject received his early education, afterwards attending Oberlin college for two years. In the fall of 1885, he entered the railway mail service, running from Missouri Valley to Chadron. After two years' service with the Northwestern, he was transferred to the Union Pacific, his work occupying the early morning and late evening hours, and during the day his time was spent studying law in the office of Sullivan & Reeder, at Columbus, Mr. Sullivan being judge of the state supreme court. Mr. Cones was admitted to the bar April 31, 1889, and established an office at Pierce, practicing in the state and federal courts. Mr. Cones was married at Pierce, July 15, 1899, to Grace Lee, who is a native of Sac county, Iowa, her parents being born in England. To our subject and his wife two children were born: Melba, who died at the age of thirteen months, and Dorothy, now a charming and accomplished young woman. W. W. Cones, the father of our subject, was one of the best known pioneers in the west, having been engaged in numerous extensive enterprises at various times, including banking and real estate, speculation, and handled large tracts of Nebraska land, he being instrumental in influencing many to settle in this state. He owned and operated the first bank opened in Wisner. He was living, retired, at Council Bluffs, Iowa, at the time of his death, January 17, 1910. His wife was Miss Lorinda Woods, a native of Tennessee, daughter of Reverend William H. Woods, who served as chaplain in an Iowa regiment during the war his wife being a cousin of Sam Houston, of Texas fame. Judge Cones is a staunch democrat, and has been honored by his party with two terms as county attorney, also has held other official positions. Martin C. Mortensen, although a native of Denmark, has spent practically his entire life in Howard county, Nebraska, coining here with his parents when a very small child, and is now proprietor of a fine farm in Warsaw precinct. Since reaching manhood he has been constantly identified with the agricultural interests of that locality, until a history of its development would be incomplete without mention of his labors and the pioneer experiences through which he has passed. is now owner of two hundred and forty acres of choice land purchased from the Mortensen estate, his home residence being located on section twenty-one, township fourteen, range eleven. He has the entire place improved in good shape with substantial buildings, and every kind of machinery for running a model farm, also has planted many shade and ornamental trees and has a fine orchard. On April 11, 1900, Mr. Mortensen was united in marriage to Anna M. Obermiller, the ceremony taking place at Nysted. Miss Obermiller was the daughter of an old pioneer family in Howard county, and is a young woman of charming personality. They have five children, as follows: Myra, Lillian, Edward C., Mildred, Evelyn, and Elvera, who form a most interesting family circle. Mr. Mortensen is a fine young man, industrious and progressive, and enjoys the confidence and esteem of all with whom he has to do. At the present time he is serving as director of school district number sixty-one. Prominent among the enterprising and progressive citizens of Valley county, Nebraska, and among the number who have been associated with the very early history of this part of the state, their connection of it running back to frontier times and days, is Cyrus H. Snow. He has seen Valley county as a dry and thinly settled wilderness, and has witnessed the progressive steps of its conversion into the prosperous community now the delight of the west. Cyrus H. Snow was born in Alleghany county, New York, April 23, 1847, and was second of three children in the family of Calvin and Lucinda (Buell) Snow, who had two sons and one daughter. The father was born September 18, 1815, and died in Michigan, November 14, 1868; and the mother was born June 30, 1820, and died May 6, 1880, her death occurring in Valley county, Nebraska. After the father's death, our subject's mother and brother William also became residents of Valley county, the brother later returning to Michigan, where he still resides; his sister is married to Stillwell Conner and lives in Ord, Nebraska. The Snow family moved to Erie county, Pennsylvania, in 1853, going on a farm near Union Mills, and in 1863 they moved to St. Joseph county, Michigan, locating near Centerville. While living here, the father and son, Cyrus, enlisted in the Fourth Michigan Battery and went to Kalamazoo to be mustered in, but owing to the father being over age and the son under age, they were not accepted. Cyrus H. Snow and sister, Mary Zelnora, came overland by team from St. Joe county, Michigan. to Valley county, Nebraska, in the summer of 1878, reaching Valley county in September, taking up a homestead on the northwest quarter of section two, township eighteen, range fifteen, and this is still the home farm of Mr. Snow, he being one of the very few that still live on the original homestead. Mr. Snow first farmed the Peter Mortensen farm for two years, living in a log house, and since that time has resided on his own farm. which is a fine one, well improved. Here for seven years they lived in a sod house until prosperity enabled them to build a more pretentious one. Mr. Snow was united in marriage to Miss Ellen Jackson, in Ord, July 6, 1870. Mrs. Snow was born in Blue Earth county, Minnesota, January 18, 1859, a daughter of Eli and Margaret (Johnson) Jackson. Mr. and Mrs. Snow have had six children, namely; Minnie Belle, wife of Lincoln Crouch, has one child and lives in Sargent, Nebraska; Frank B., at home; James E., also at home; Julia Etta, died June 13, 1887; Archie A.. at home; and Gerald D., died January 17, 1892. Mr. Snow was one of the first actual settlers in this portion of Valley county, and has had much to do with its development. He and his family have had much to do along social and educational lines. They have passed through the different Nebraska years, and now enjoy the prosperity of their later years. They have the respect and esteem of a large circle of friends. Mr. Snow has experienced all the incidents of pioneer life, including the fighting of prairie fires, the drought of 1894, and a severe hail storm two years later. Mr. Snow is a republican and a member of the Tribe of Ben Hur. William Seip, who resides in section thirty, township twenty-four, range two, Madison county, Nebraska, is one of the leading old-timers in this region who has always done his full share in the betterment of conditions throughout the community in which he lives. William Seip is a native Nebraskan, his birth occurring March 21, 1878, on his father's homesteaded farm, where they now live. He is a son of Leonard and Minnie (Touro) Seip, who were married in 1865. The father is a native of Germany, his birth taking place in the province of Hesse, September 24, 1836, The mother is a native of Pommerania, Germany, and was born October 15, 1848; and died December 28, 1909. Our subject was fourth in the family of four children, four of whom are living: Adam, William, deceased; Emma, and William J., our subject. as Nebraska was then known, to take advantage of the cheap land to be had there at that time. He came to Madison county, where he bought the Schrotte homestead, which is located in sections thirty and thirty-one, township twenty-four, range two. On this land they built a log house in which the family lived for six years. In those days, Columbus and Wisner, several miles distant. were the nearest market places, and as ox teams were about the only mode of travel then, it took several days to make the round trip to market and return. Deer and antelope were plentiful at that time, and frequently could be seen in herds grazing on the open prairie. Many hardships and discouragements were endured by the pioneer settler of this country; the grasshopper pests that infested this region in the early days were about the greatest source of anxiety that had to be met, and for three successive years the crops of this section were a total failure on account of the hordes of these grasshoppers that swept down and destroyed every vistage [sic] of vegetation; this made it very hard for our family to get along and for a time they suffered many hardships on account of same; but patience and perseverance have brought their full reward, and where privation and hardship once reigned there is now plenty and comfort. As late as 1894 our subject lost the entire season's crops by the hot winds that were a result of the severe drouth. Mr. Seip was united in marriage July 17, 1907, to Miss Martha Beckdorff, and Mr. and Mrs. Seip are the parents of one child, a daughter, Emma. They are a fine family and enjoy the respect and esteem of all who know them. They are members of the Baptist church, and Mr. Seip is a democrat and a Modern Woodman. During the last fifteen years or so, one of the most prominent members of the farming community in this section of Nebraska, has been the above, perhaps most widely known as the proprietor of the Fair View Stock Farm. He is universally respected and has met with unbounded success, both in genreal [sic] farming and stock raising. Charles Van Skike was born in Bartholemew county, near Columbus, Indiana, on October 4, 1860, being the third of six children in the family of David R. and Margaret (McCallip) Van Skike. Charles grew up on the Indiana farm, attending the little district school regularly, and helping manfully with his share of the work on the farm. In the spring of 1879, David Van Skike, with his wife and five of the children came to Howard county, Nebraska, meeting there the other son, James, who had gone first. Mr. Van Skike also had three brothers who had settled there in 1872, being the original homesteaders. He joined them and purchased railroad land on the county line between Howard and Greeley counties. The entire family remained here until the dry year of 1894, when all except two sons, James and Charles, moved to the Pacific coast, settling in Eugene, Oregon. They afterwards moved again to Everett, Washington, and here David Van Skike and his wife lived until the time of their death, which occurred in 1908-1909, respectively. Charles Van Skike, the subject of this sketch, remained on the home farm with his father until about his twenty-fourth year. In November, 1888, he was married to Miss Carrie Scott, the youngest child of Samuel C. and Caroline (Raydure) Scott, old settlers of this county. In the fall of 1892, Mr. Van Skike purchased eighty acres in section thirty-three, township eighteen, range twelve, and is now the owner of two hundred and eleven acres, which. is known as the Fair View Stock Farm. He has a fine comfortable home here, with all modern appointments, and his farm is well equipped with substantial buildings and improvements. He has been especially successful in handling thoroughbred improved Chester White swine. With the exception of a few months in 1884, which were spent in Colorado, Mr. Van Skike has made his home in Nebraska continuously. Although now one of the most prosperous farmers in this section, yet he as well as others, suffered through the dry year of 1894, when so many gave up and left the state. He is a much esteemed citizen and has aided materially in the development of this part of the state. Mr. and Mrs. Van Skike have had seven children, six of whom are living. They were named as follows: Samuel Carl, James Walter, Mary, Francis, Fred, Edward, deceased; and Maude. In politics Mr. Van Skike is independent of party lines. He is a member of the Modern Woodman of America. His first dugout, in which he lived three years, had a dirt roof and floor; the second residence, a sod house with a board roof, was occupied two years when he built a good frame dwelling. During the blizzard of January 12, 1888, Mr. Van Skike was ministering to a sick friend and a dreary night it proved to be. In compiling a list of the influential citizens of Cedar county, Nebraska, who have become identified with the development of the agricultural interests of that region, a prominent place is accorded the name of the above gentleman. Mr. Wickett has been a resident of this county for a number of years, owning a comfortable home in section twenty-one, township twenty-nine, range three. He has built up a good farm and has gathered about him the comforts and many of the luxuries of life and is reaping the reward of his many years of earnest labor. was born in 1861. His father, A. Wickett, came from England when but a small boy, and his mother was a native of Canada. Our subscriber remained at home for a number of years, helping his parents. He received his education in Canada. Believing that even greater opportunities. existed in the United States than in Canada, he came to Filmore county, Minnesota, in 1882, but remained there only one year, and concluded to locate in Calcasieu Parish, Louisiana, where he took up a homestead and tree claim, remaining for twelve years. He came to Cedar county, Nebraska, in 1896, and bought what was known as the Charles Holcomb homestead, which farm he still occupies. He has made extensive improvements on the place since it came into his possession, and he has now a farm which is quite as good as any to be found in that locality. One noticeable feature about his place which attracts the attention of every chance passer-by, is the thrifty grove and orchard, which in all comprises about seven acres. In 1890, Mr. Wickett was married in Louisiana to Miss Lena Fuller, of Hancock county, Iowa. Four children have come to, bless their home, to whom they have given the following names: Nellie M., Allen E., Verner A., and Winifred B.
Mr. Wickett is a republican, but is not bound to the party on all occasions. The present commercial and agricultural prosperity enjoyed by the majority of the people of Nebraska is due to the efforts of the men of ambition and determination who settled in that state while it was undeveloped, and the soil was in its virgin state. 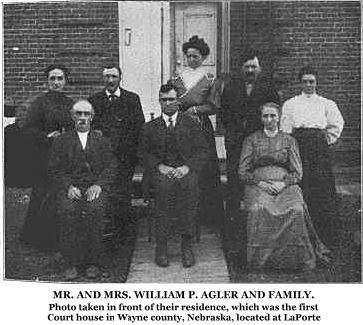 Among the pioneers of Wayne county, is W. P. Agler, who is now located on a well cultivated farm on section twenty-five, township twenty-six, range four, and is one of the leading men of his community. Mr. Agler was born in the Keystone state, July 21, 1835, a son of Jerome and Sarah (Brittain) Agler, the father of German lineage, and the mother of English descent. The parents were born in the state of Pennsylvania, and married there. They had nine children. Mr. Agler received his early education in his native state, and in 1851 accompanied his parents to Illinois. He was reared to farm work, and to the habits of industry and thrift which have governed his later years in making a home for himself, and winning his own way in the world. In April, 1870, Mr. and Mrs. Agler started for Nebraska, coming by rail to Missouri Valley, Iowa, and from there driving through to Wayne county. They first secured a homestead a mile and a half northwest of his present home, on section fourteen, township twenty-six, range four, where he built a frame house of cottonwood lumber, sixteen by twenty-four feet in dimensions, and this was his home for some time. During the first few years he suffered greatly from the depredations of the grasshoppers, and endured many hardships, as did the other pioneers. He had often to fight the progress of prairie fires which threatened his home, his crops, and his stock, and endured many other trials. There were many deer and antelope in the region at first, as well as a few elk, and his neighbors were few and distant. About 1892, he secured his present home where he has brought his land to a high state of cultivation and has made many other improvements, erecting suitable buildings for the care of his stock and grain and beautifying the place, until he now owns one of the valuable estates of the county. He is well known as a man of intelligence and enterprise and is interested in whatever concerns the welfare and advancement of the people. He and his wife have many friends in the county, where both are well known, and both are interested in the cause of education. Mr. Agler was united in marriage September 28, 1860, to Miss Minnie Harmon, of McHenry county, Illinois. She was born September 28, 1837, at Amhurst, New York, and is a daughter of Benjamin and Clarissa Harmon, natives of Buffalo, New York. Three children have been born to Mr. Agler and wife: Viola, wife of C. A. Fox, resides on a farm near Mr. and Mrs. Agler; they have six children: Eva, wife of Andrew Folck, died January 22, 1911, leaving a husband and three children; John, who married Annie Lueck, has four children, and lives in Benson, Nebraska. September 28, 1910, Mr. and Mrs. Agler celebrated their golden wedding anniversary at their home in Hunter precinct. Over two hundred and fifty of their relatives, friends and neighbors were present. The same couple who stood with them when they were married in 1860 were present, and for the second time stood with them when they were married. Mr. and Mrs. Agler kept the first postoffice in Wayne county. It was known as Taft, and was named for Senator Taft of Nebraska. Mr. Agler had learned the blacksmith trade in Illinois, and ran the first shop of that kind in Wayne county. He was present at the meeting called for the purpose of organizing the county in 1871, and he carried the ballot box which contained the first votes cast in the county, to West Point. Mr. Agler operated the first harvester and binder ever used in Wayne county, and he and Judge Cyrus E. Hunter ran the first harvester and binder ever used west of the Missouri river, and shipped by way of Sioux City. Mr. Agler and Judge Hunter also ran the first threshing machine ever used in Wayne county. He has built five hundred and sixty-five bridges in Wayne county for the county. He worked for the county twenty-six years at bridge building. Mr. Agler owns forty acres which was the county seat of Wayne county before it was moved to Wayne in 1882, and known as La Porte. His present residence is the building erected and used as the county court house. It is a large, substantial brick structure and has a very imposing appearance. A picture of this building showing also the family group appears on another page. Mr. Agler rents his home to the county, and he is the county superintendent of the poor. La Porte was located on the land he now owns, and was a town of considerable size at the time it was voted to take the county seat to Wayne. All the buildings have been moved away, and the old court house, Mr. Agler's residence, is all that is left of a once thriving town. Mr. and Mrs. William P. Agler and Family. Prominent among the residents of Central City, Nebraska, is the gentleman above named who has lived in Merrick county the forty-five years of his life time. He has built up an envious reputation as a worthy citizen and business man, and is esteemed by all who know him. Mr. Vieregg was born in Merrick county, Nebraska, September 12, 1866, and is one of the first of Merrick county's native born sons. He was born on the farm, and about 1870, the family moved to Central City to reside; this little village had but few homes and few people, and was then more commonly, known as Lone Tree. Here our subject grew up, receiving a common school education and also received advantages at the Nebraska Central College, located at Nebraska City. Mr. Vieregg left school in 1883, becoming connected with his father in the grain business, and also in the milling business until the year 1900, at which time he became connected with the Farmers' State Bank of Central City, of which he is now cashier, and which is one of the leading banks in this section of Nebraska, having been organized in 1886. Mr. Vieregg was married to Miss Myrtle Scott in Central City, June 5, 1907, Miss Scott being a daughter of M. V. Scott, an old time resident of Central City, and president of the Platte Valley State Bank. Mr. and Mrs. Vieregg have one child, a daughter, Wilhelmina Fay. Mr. Vieregg is one of the wide-awake hustling young business men of central Nebraska, known for his business integrity and high character. He has a pleasant modern home, and he and his wife are prominent in social and educational circles. For about thirty-five years the gentleman whose name heads this review has been identified with the history of the development of northwestern Nebraska, and his large and valuable farm in Knox county is evidence of his labors during these years. He has succeeded in building a good home and is one of the highly esteemed citizens of his community. He resides in section two, township thirty, range six. Mr. Ondracek is a native of Chicago, his birth occurring in the year 1874, and is the son of John and Anna Ondracek, both natives of Bohemia. His parents came to America, where they could get land cheap and have a better opportunity to get a start in life, and after landing in New York City they at once came to the state of Illinois where they remained two years. In 1876 the family came to Knox county, Nebraska, where they took up a homestead two miles west of Verdigris, on which land they built a log house. On this homestead the family went through the many hardships and dangers incident to those earliest pioneer days, when the red man roamed at will through the unsettled country, the Indians being a source of anxiety and frequent scares to the venturesome white men who first set foot on the territory. Our subject grew to his manhood on the old homestead farm, and in 1897, was united in marriage to Miss Anna Holan, and Mr. and Mrs. Ondracek are the parents of five children, whose names are as follows: Anna, Joe, Clara, Adolph,and Theodore. They are a fine family, and enjoy the esteem and respect of all with whom they have to do. They have a wide circle of friends and acquaintances. In 1896 Mr. Ondracek bought three hundred and sixty acres of fine land, known as the Kroker homestead, and has improved the place until he and his estimable family are now enjoying the comforts of life in one of the most pleasant and beautiful homes of the locality in which they live. Among the prominent, public-spirited citizens of Nance county, Nebraska, the gentleman above named holds a foremost place. He has occupied many offices of trust in his township and county, and has been an important factor in the official life of the section for many years past, incidentially [sic] building up for himself a fine estate and gaining the respect and esteem of all with whom he has bad to do. With his family, he occupies a handsome residence situated about half a mile east of Belgrade, where they entertain their many friends with lavish hospitality. southwest of where Belgrade now stands. They were engaged in the grain and stock raising business for a number of years, succeeding in building up a fine farm, and were well known throughout the section as prosperous and practical agriculturists. Until recently Mr. Palmer was owner of over two hundred and fifty acres of finely improved land, most of which was in Antelope county, but this he sold in 1911. He owns twenty-one acres, which he occupies as his home place. He has about sixty acres in addition to his home place, which is in Timber Creek township, Nance county. Besides his own home he owns six houses in Belgrade and a number of building lots. On April 9, 1884, Mr. Palmer was married to Miss Roxie Elizabeth Main, who is a native of Iowa, coming to Nebraska with her parents, Silas and Elizabeth Main, in the spring of 1880, they settling in Nance county and afterwards became prominently known as among the prosperous and worthy citizens of their vicinity. They occupied a farm of one hundred and sixty acres, located three miles from Belgrade, and resided there until 1895, when he and his wife moved to Belgrade, where the father died on June 16, 1906, his widow following him a little more than a year later, aged eighty-six and eighty years respectively. Mr. and Mrs. Palmer have two children Lena M., wife of Floyd Cooley, they living in Belgrade, and Joseph A. L., still with his parents on the home place. Politically Mr. Palmer is a staunch democrat. During the early days he served his township as road supervisor, and was treasurer of school district number twenty-two, for a number of years. In 1886 he was elected assessor of Timber Creek township, serving one term, and several years later held the same office for one term. In 1906 he was elected county supervisor, and in every position of trust which he has held, has retained the confidence and esteem of his fellowmen. For more than thirty-three years, the west has known John Hubby as one of her loyal citizens. He first came to Nebraska in April, 1878, and settled on a homestead seventeen miles northeast of O'Neill and six miles south of Paddock, their postoffice. He drove into the section from Iowa, bringing with him two young horses, and several cows. Besides his homestead Mr. Hubby leased a. school section and farmed the entire tract for sixteen years, and, while meeting with occasional failures, on the whole he was most successful. In 1894 he removed to Benton county, in southwestern Missouri, but on account of his family suffering from malaria in that vicinity, was obliged to return to the prairie country in November, 1896. The trips back and forth were made by team and wagon, camping at night by the wayside, and being exposed to all sorts of weather, at one time enduring a three days' storm. A ranchman offered shelter, and a welcome haven it proved to be, as a November storm is something to be feared on the open plains. On his return to Nebraska he came to Holt county and bought a tract of deeded land near Paddock, on which he resided from the spring of 1897 up to March, 1905. He then traded it for town property in Lynch, holding sixteen lots, and a three acre tract in the edge of the village. Mr. Hubby was born in Kent county, Canada, near Montreal, on May 6, 1840. His father, John Hubby, was a native of Scotland, who came to America and married Hannah Jones, of New York state. When our subject was two years of age, the family settled in Winnebago county Illinois. They later moved to Lynn, Iowa, where Mr. Hubby made his home until coming to Nebraska. He was married in Polk county, Iowa, on June 6, 1867, to Miss Mary Wheeler, a native of Indiana. Of six children born to Mr. and Mrs. Hubby, five are living: Nettie J., Charles Edward, Gertrude, Mary Maude and Pierre Frank, all married excepting the last mentioned, who is still with his parents, and holds the office of city marshal of Lynch. Politically Mr. Hubby is a republican, having voted that ticket since the war, in which he served for four years. He first enlisted in Company C, Second Iowa Cavalry, in April, 1861, serving up to September, 1863. He was then transferred to Company G, Twenty-fourth Iowa Volunteer Infantry, and remained in the service four years and eight months, altogether. He took part in the battles of Fort Henry, Fort Donaldson, Shiloh, Corinth, Iuka, Independence, Missouri, Pea Ridge and Helena, Arkansas, and later, the Sieges of Vicksburg, Jackson and New Orleans. Mr. Hubby was detailed to duty in the quartermaster's department, in the fall of 1863, and was discharged at New Orleans on September 26, 1865, having seen every side of a soldiers' career, and he has a verv vivid recollection of all the horrors of that terrible time. In 1907 Mr. Hubby was elected justice of the peace at Lynch, and is still serving in that capacity. He is a prominent comrade in the Grand Army of the Republic, and with his wife attends divine worship at the Methodist Episcopal church.